Pembrokeshire is arguably one of the most beautiful parts of the UK and is blessed with hundreds of miles of rugged coastline. The Pembrokeshire National Park is a pristine and wild place for sea swimming, with towering cliffs and stacks as well as countless pristine beaches. 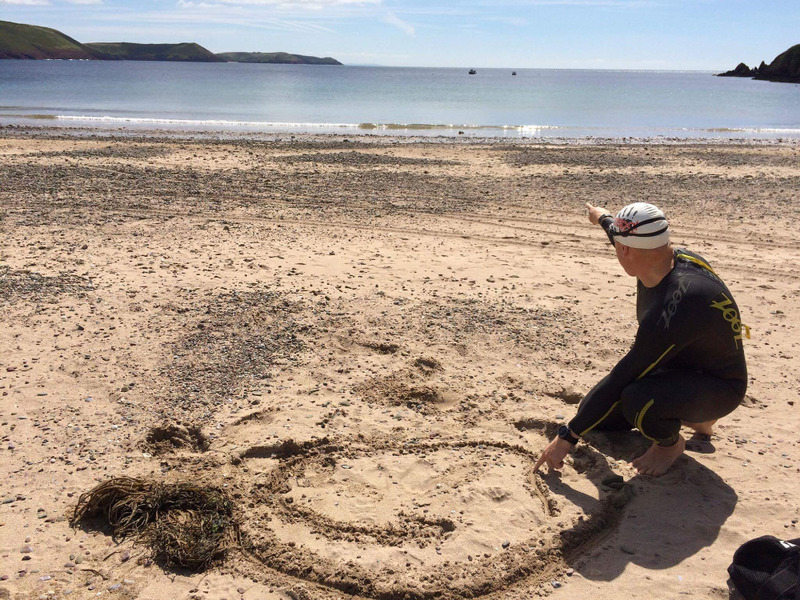 Pembrokeshire is a sea swimming paradise and Swim Pembrokeshire offer well structured, safe, private or group open water coaching sessions to suit a variety of needs. Our sea swimming coaches are ASA Level 1 Swim Coach and ASA Level 2 Open Water Coach qualified and have years of experience swimming in the seas around Pembrokeshire and overseas. In addition, they are experienced triathletes and endurance event swimmers and one is an ex-Wales national swim champion. That's plenty of expertise and experience to help hone your sea swimming skills! If you are interested in 1-to-1 sessions or if you want to get some open water coaching with a couple of friends; or if you simply want to try sea swimming with experienced coaches, then we can arrange a private session with you. Our hourly sessions can be booked on an ad hoc basis; or you can take advantage of our multi-session discounts and opt for 5,10, 20 or even 50 hour packages, perfect for those who want help planning a structured training session with clear aims on a weekly or monthly basis throughout the year. We hold regular group sessions on a weekly/bi-weekly/as needed basis here in Pembrokeshire, so if you are interested in joining, please get in touch with us or like our Facebook page and join us when we have the next one. Training for an event? Why not take advantage of reduced rates and structured training programs to suit your specific needs? Book a block of 5, 10, 20 or 50 hours in advance and get greatly reduced rates as well as a documented training plan that is designed for your technical and event based needs, plus session reviews and even even video files of your stroke and feedback on how to improve. Why not book your place on a personalised one-to-one session, or a group session with friends, and start sea swimming off the Pembrokeshire coast? Check out our current portfolio of established swim routes here. All locations have undergone a risk and safety assessment, which will be reviewed with you before entering the water. Our list of sea swimming places in Pembrokeshire is growing all the time as we scope out new and challenging spots - plrease refer to our blog for updates or like our Facebook page to receive notifications of new open water swimming spots in Pembrokeshire UK as and when we add them. Want to get more information on what's included in coaching sessions? Want to discuss options that best suite your needs? For more information or to request a call back, please contact us here.